Got a camper in your crew? We recently threw one BOSS camping-themed-birthday-party and wanted to share our shin-dig stylings with lil' campers everywhere. Our party was in early November, and good weather was paramount. We planned outdoor activities, of course, so we kept our eye on the forecast. Keep a rain date set as a back-up plan. I found adorable camper party boxes, a camp-themed tablecloth, napkins, cups and plates, bug jars and bandanas (for party favors) at Oriental Trading Company and ordered several weeks in advance. Next, I hit up our local dollar store and found glow bracelets, bug stickers, tons of marshmallows, awesome LED flashlights and fun prizes to include in games, activities and the favor boxes. Prizes were stored in an old Easter basket for easy portability for the outdoor games. Also, weeks in advance, I ordered fun flannel shirts from Carters. These couldn't be cuter and were perfect for the camping theme. Other campers added vests, hats, scarves, boots, etc., and, of course, each kiddo got his/her own bandana in the favor boxes. We collected tons of gourds from our garden, purchased some Crayola washable paint and planned a gourd-painting event as one of the party activities. SO fun! 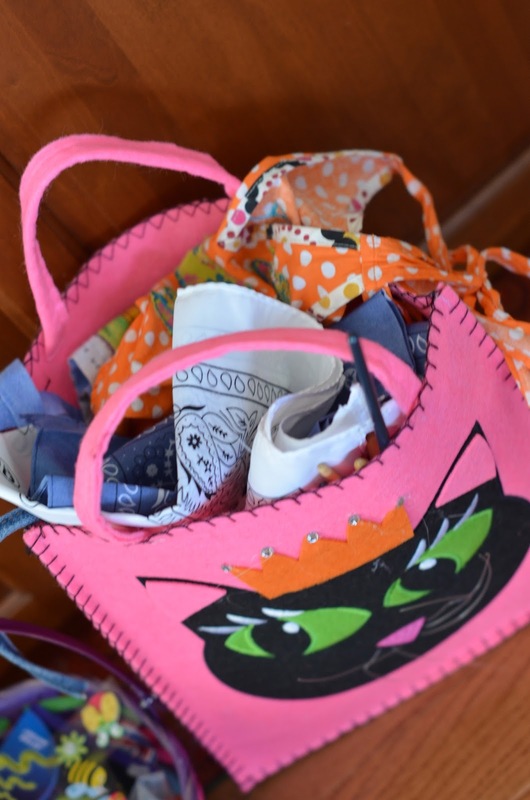 I threw paintbrushes, water cups, paper towels, smocks, extra bandanas, craft paper and googley eyes into a bag to easily tote out to the outdoor painting table. We found these amazing signs and posted them all over our property to create a wonderful camping vibe. They added so much to the groove. 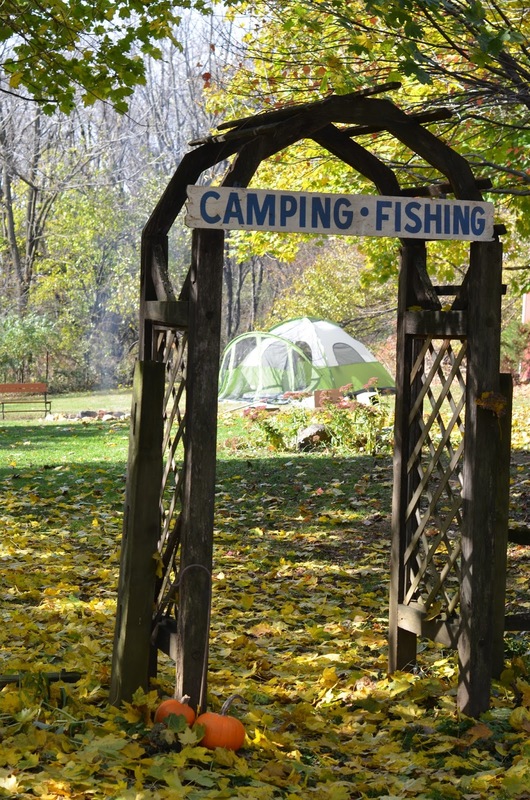 Our favorite was the welcoming sign, which we posted along with a camping lantern to usher guests toward our campground setting. Next, we planned a Scavenger Hunt for the kids to collect objects in the yard. Each guest was given his/her favor box immediately upon arrival so they could gear up and get ready for the events. Inside, we'd placed the Scavenger Hunt rules and items. They could use their boxes to store their found items. 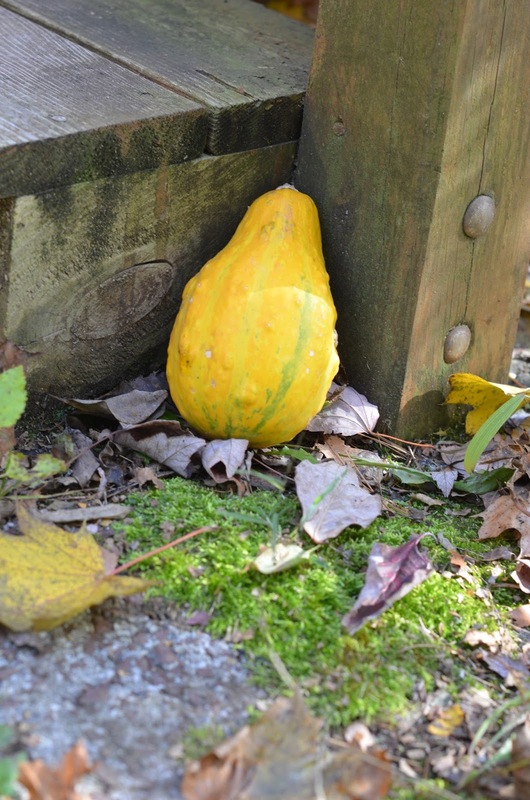 We hid extra gourds all over the property to be found and collected during the Hunt. The first camper to complete the Scavenger Hunt chose a prize from the basket. We also had prizes for the most creatively painted gourd and the "Coolest Camper Award"-given to the camper who exhibited the most overall enthusiasm. Inside, we prepared a "Kid Camper" table, for the birthday girl and her pals, a General Camper table, and an "Eagle Scout" table, which was reserved for the honored grandparents and adults. The kid table had the camper-themed plastic table cloth, and the Eagle Scout and General Camper tables were done up with traditional linens. We added flameless candles and our own nature books to create centerpieces for each table in hopes that guests would flip through them and learn something new. Wish I'd gotten a better photo, but we also added extra bandanas to create more striking centerpieces. Then, I collected nature-themed objects from around our home to create areas of intrigue for the party. Here's a little set-up I put together for the guest bathroom. I added another flameless candle in here for evening ambiance. As a family project, we dug out and prepared a new fire pit for the party. Stay tuned for the upcoming how-to. Of course, we pitched our biggest tent for the party, and the children had a blast running in and out of their designated site. We had a fire going as our flannel-shirted guests arrived and, naturally, it was a hot spot for gathering both kids and adults throughout the event. Fun appetizer- clementines with organic celery stems, made to look like pumpkins! When it was time for dinner, we all headed in to stuff it. After tons of food, our amazing Sweet Dutchess campfire cake (with edible flames!!!) came out for the big HAPPY BIRTHDAY ritual. 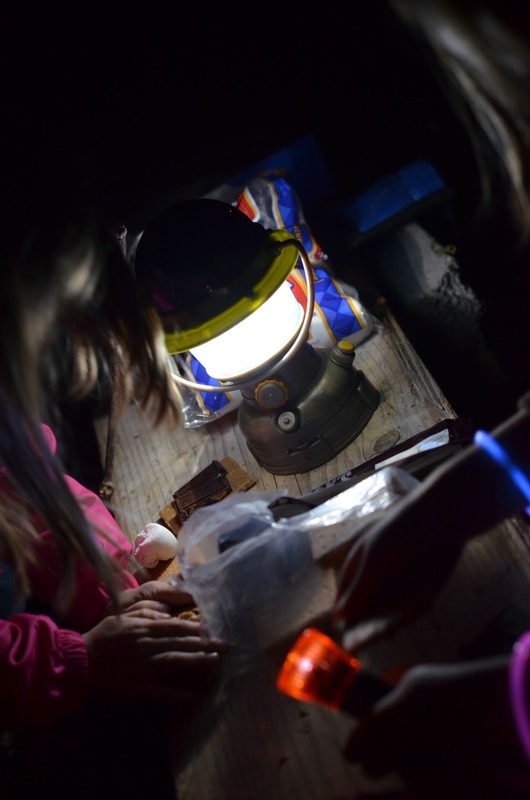 As the evening rolled in and the darkness fell, the kiddos had a blast sporting their glow bracelets and flashlights. Of course, we gathered 'round the campfire, roasted marshmallows, gabbed and giggled while sticky-handed kids ran back and forth between the fire pit and their tent. So fun! One of the birthday girl's gifts, that awesome Uncle Milton Lantern, came in handy at the Smore Station! You just can't beat a campfire, right? 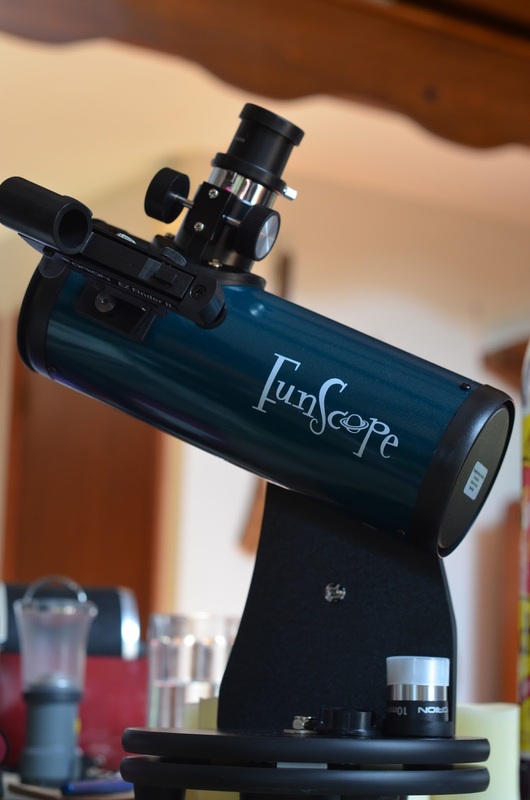 The BIG prezzie of the night was this Orion FunScope Tabletop Reflector Telescope. Checking out that gorgeous moon with this scope was the icing on the cake! A perfect finale! This turned out to be our favorite party yet, and it was a great way to welcome the cooler weather and celebrate all things AUTUMN! We grown-ups even found time to sneak out to enjoy that campfire long after the kiddos were conked for the night. BONUS! What are some other ideas for fun birthday theme parties for kids? Feel free to share your creativity here! Hen-of-the-Woods (Maitake) Mushrooms: Eat THIS!